The truth is most adults never take the time to really slow down enough to connect with self in this way. I love meditating but even there I have a completely different experience of self than when I take the time to connect with the mirror. The mirror doesn’t allow us to hide in any form of fashion when we truly drop in and thus the reason so many avoid it with a passion. Maybe I am weird…actually scratch that… I know I’m a weird! But there are a few “weird” things that I have always found myself doing since I was a tiny child. And getting lost in the mirror has always been one of those things. Now, not in a sense of vanity and adoring how beautiful and wonderful I looked but simply to look at my own eyes. Before I ever knew there was such a thing as the practice of eye-gazing, I would sit for long stretches of time and go into a meditative state with self and the mirror. I would try to bring together the person IN my eyes and the person sitting on the bathroom counter. They felt strangely connected, yet separate, and yet I remember the person IN my eyes seemed so different and older than the 4yr, 7yr, 10yr old sitting in front of the mirror. I didn’t know at the time how right I was! I didn’t understand that in those hours spent in front of the mirror I was connecting with my spirit. I didn’t understand that I was connecting with God and my angels. Though I stopped the practice as I got a little older and in truth, mirrors became my biggest enemy for the next 10-15yrs. I avoided them at all cost. No more connecting with self. No more connecting with my soul. I lost the mirror and thus I lost connection with self. I left myself on the other side of that mirror in wait. 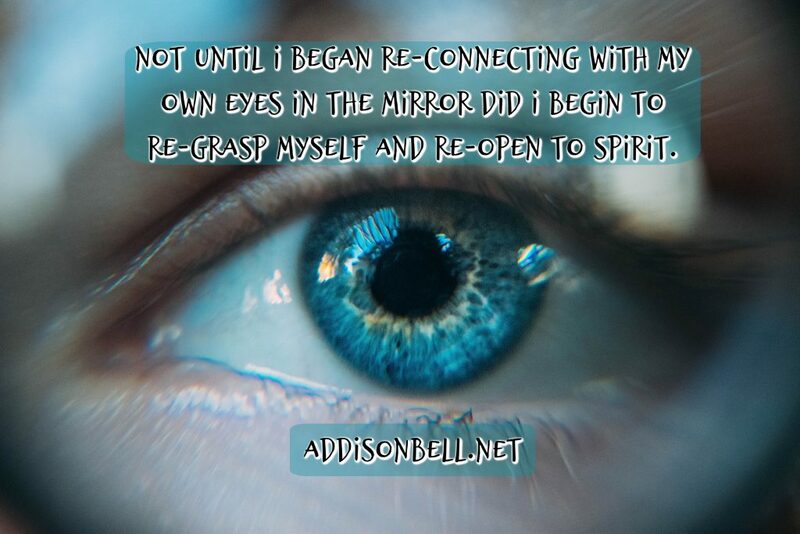 And it was not until I began re-connecting with my own eyes in the mirror that I began to re-grasp myself and reopen to spirit. Now, when I take the time to settle down into my own eyes it is like the world and worlds beyond open up if I allow. So again I ask you, when was the last time you gazed deeply into your own eyes and allowed yourself to truly see? We often think of looking into the eyes of those we are talking with or a partner. We have all heard the eyes are the windows to the soul but we never stop to look through our own windows. And in truth if you can’t/don’t connect within self first then you will never be able to see the depth in someone else. My Friday night challenge is for you to take the time to truly look into your own eyes. Breathe in and give yourself enough time to really begin to feel and let go. Look into your eyes and simply allow whatever needs to come into awareness, present itself to you. Give yourself this time to simply honor self for a few moments. And then I suggest doing it for a few days in a row and see how the practice changes before your eyes and your level of connection. It can be a truly connective practice and way to see self in a deeper way. Even if you already have meditative practices that you rely on, this one can add a new layer. Wishing you all a fantastic rest of your evening and weekend! ← Stop the Chaotic Energy and Just Stick with it!